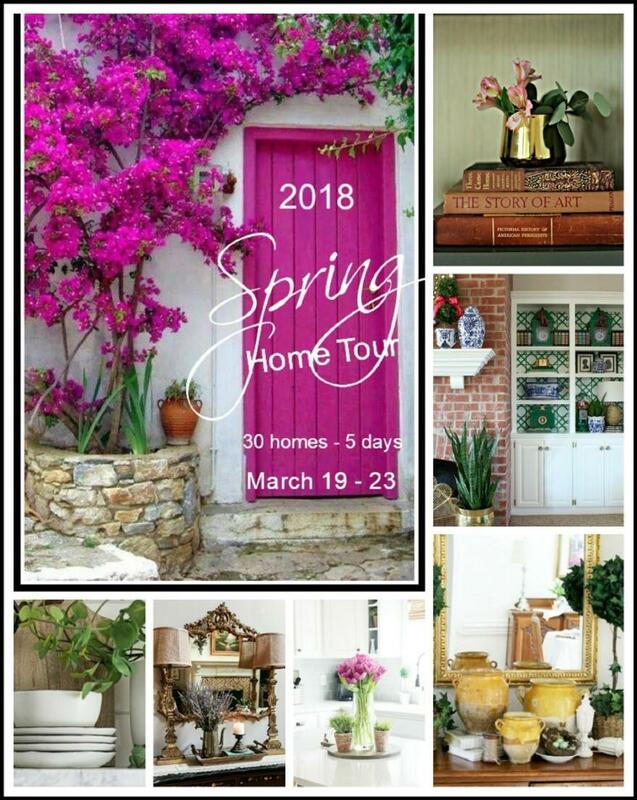 Today I'm delighted to be a part of the 2018 Spring Home Tours hosted by Marty of A Stroll Thru Life. If April sent you over from House by Hoff, I'm so glad you're here! She always has the best ideas and I love finding inspiration in her beautiful vignettes, I'm sure you enjoyed her tour. If you're visiting for the first time today, let me introduce myself. I'm Jennifer and I live in Edmond, Oklahoma, where my husband is a Southern Baptist minister. We have two teenagers, a son (dimples) and a daughter (tangles). 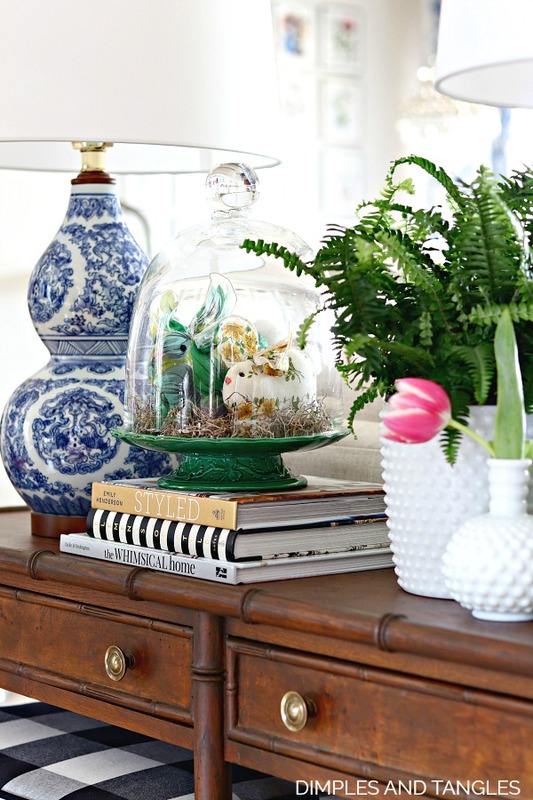 You will quickly see that I adore bold color and mixing patterns, get excited about a great Craigslist score, and am not afraid to get my hands dirty with a DIY project. Welcome to our home! Although there's not a fern to be had in town yet to fill my planters, the rest of the porch got a little spruce up for Spring. *This post contains affiliate links, see my full disclosure policy here. 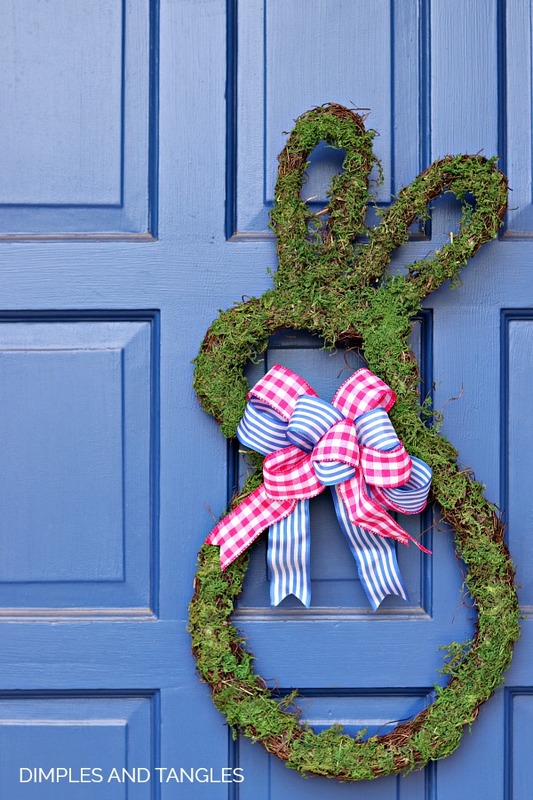 I picked up this cute bunny wreath at Hobby Lobby, removed the burlap ribbon it came with, and added ribbon more to my liking. He's hung with a command hook and I looped a small piece of pipe cleaner through the back of the wreath to attach to the hook. I filled my lanterns with green Spanish Moss, pillar candles (don't worry, they're battery operated! ), and some decorated eggs. 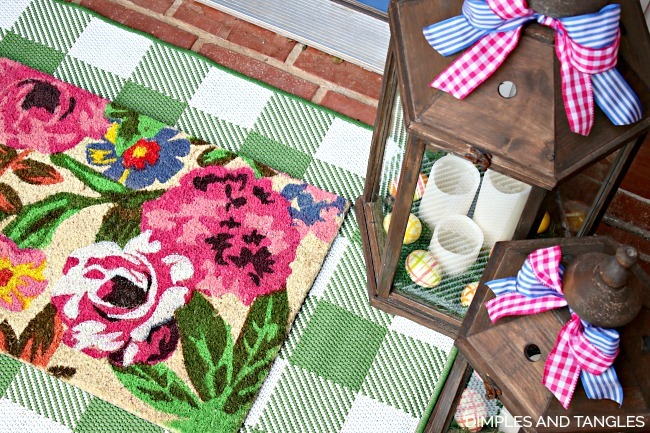 If you're familiar with my style, you won't be surprised that as soon as I saw it I had to have one of these buffalo checked outdoor rugs (it comes in several colors and sizes). I layered a coir mat over it since I can't resist an opportunity to mix and match colors and patterns. Come on in, and join us in the Living Room! I've been busy for the past month or so making a few major changes in this room. 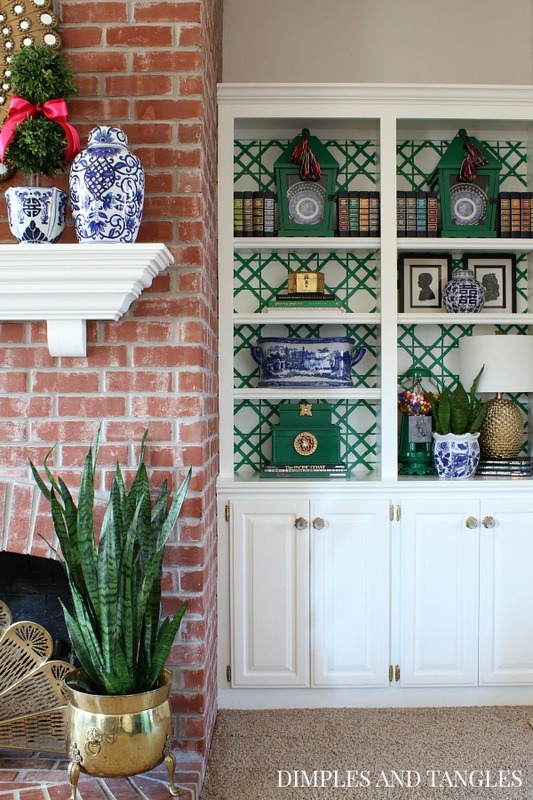 Last week I shared that I painted the backs of the builtin shelves in a bamboo lattice pattern. And I've also had my sewing machine working overtime to make new curtains across the back of the house in the living room and breakfast nook. I used this fabric and I'm enjoying the fresh new look. Actually, I've had some form of black and white curtains for so long that I'm not quite used to it yet but I like it! I assembled the craziest bunch of flowers for the coffee table, and I'm completely in love with how sprawling and wild it turned out! 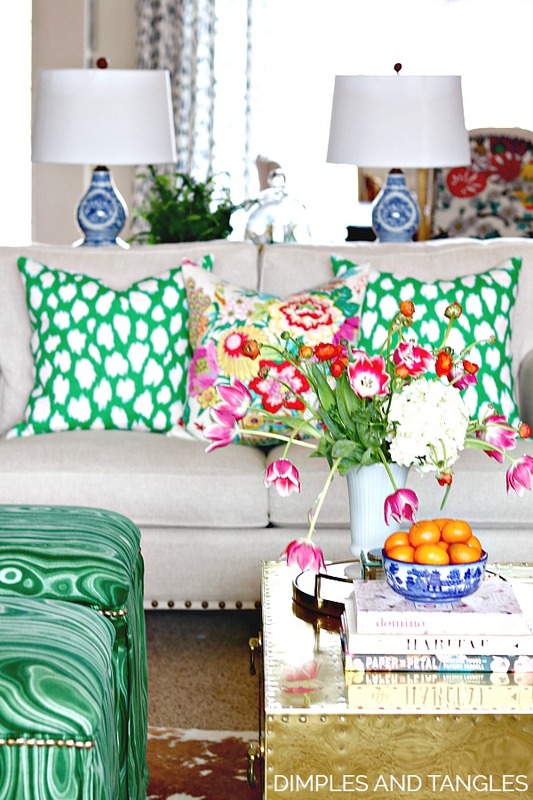 I can't share a seasonal tour without a new pillow or two, and these vibrant new floral pillows were just the right mix of colors for my space. My mother-in-law made these sweet vintage hankie bunnies years ago that I put out every Spring. She got the pattern from the March/April 1991 issue of Country Woman magazine if you're interested in trying to hunt it down. Looking for a similar item from my Living Room? Use the arrows to scroll left and right, then click on the image you'd like shopping details for. 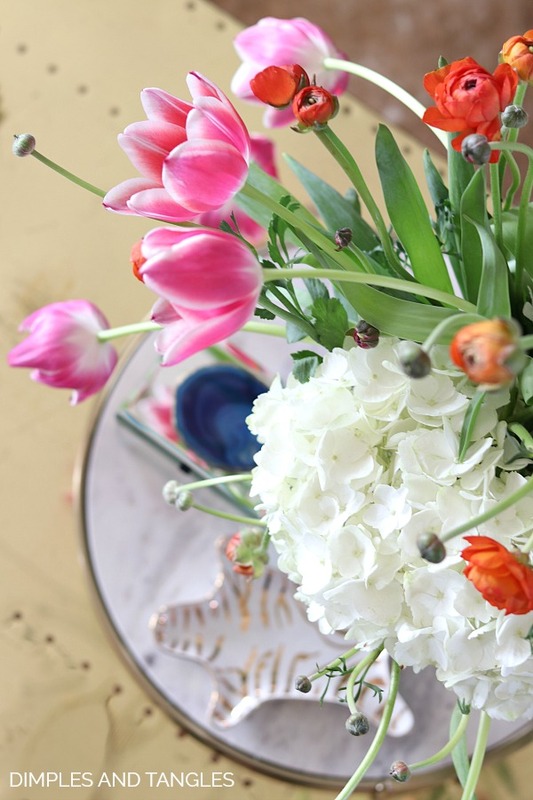 but here's a sneak peek of my Spring Easter table that I'll be sharing tomorrow. I hope you'll join me then to take a better look! 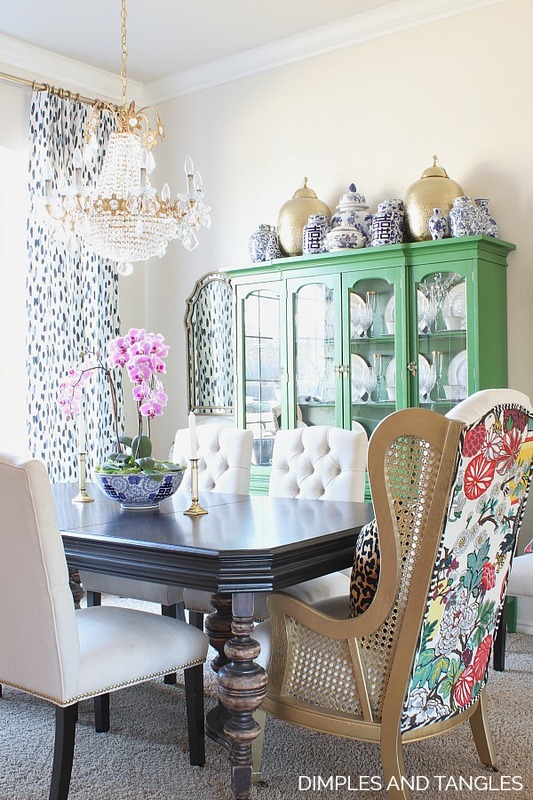 Looking for a similar item from my Dining Room? Use the arrows to scroll left and right, then click on the image you'd like shopping details for. Thank you so much for touring my Spring Home today! If you're new here and enjoyed the tour, I'd love to have you join my mailing list to receive each new post straight to your inbox, simply enter your email in the box below. 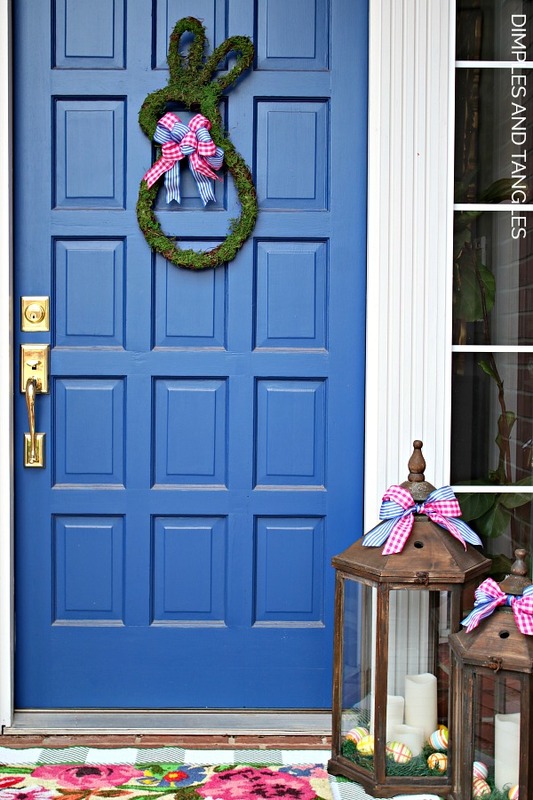 Also, if you'd like to see more ideas from my home, check out other Seasonal Tours here. Next on the tour, stop by and see Christy from Our Southern Home and be sure to check out all of the other gorgeous tours this week all decked out for Spring! your home looks so beautiful and colorful, jennifer! 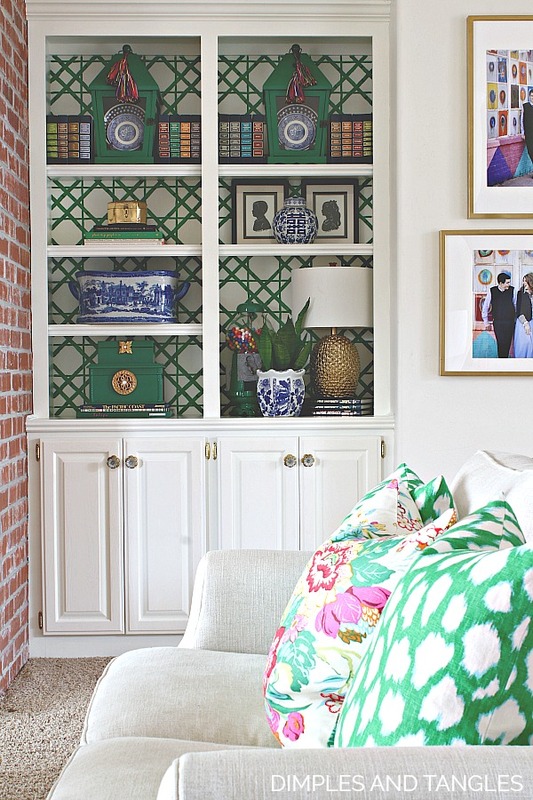 loving those bookcases you painted! Thanks Cassie! Hope your week is going well! Jennifer this may be your best tour yet! 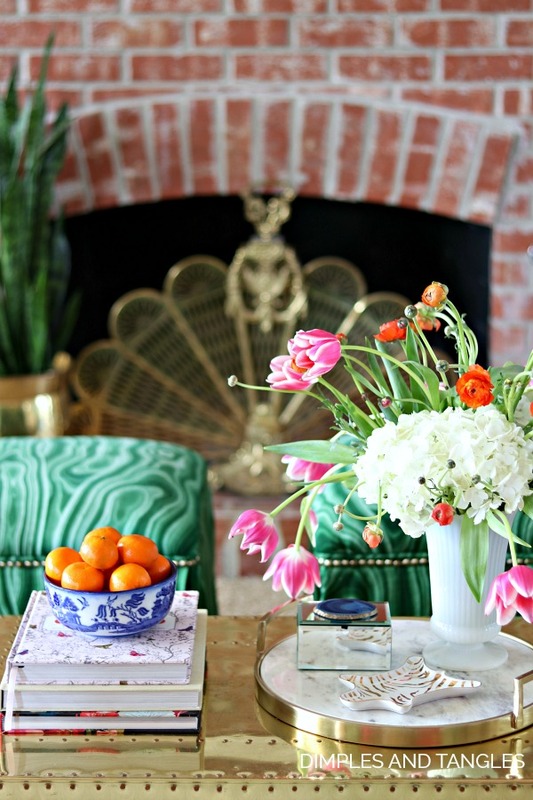 I love the happy color and the pink bamboo tray is divine. Is it vintage? First of all your bookshelves came out beautifully! I am loving all your cheerful spring colors. Gorgeous tour! Thanks Shelley, glad you enjoyed it! 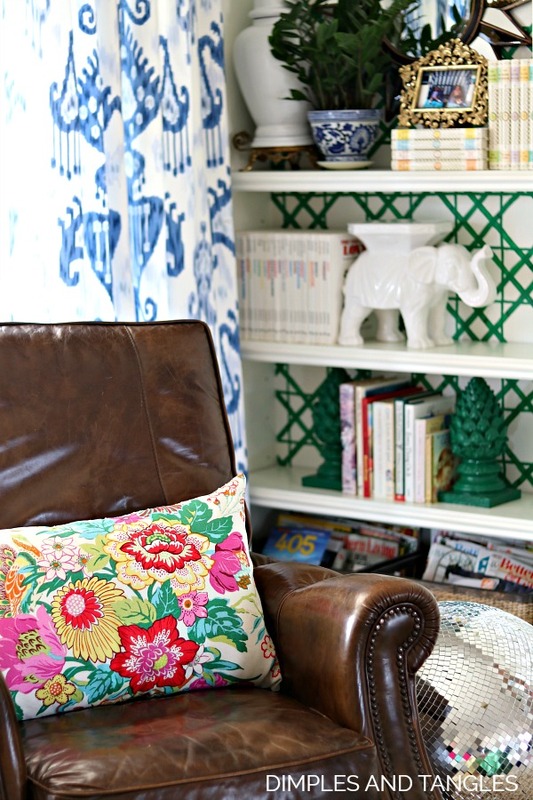 One the bamboo bookshelf back and your colorful spring pillows. So pretty as always! Thank you Julia, stay warm in all of the snow! 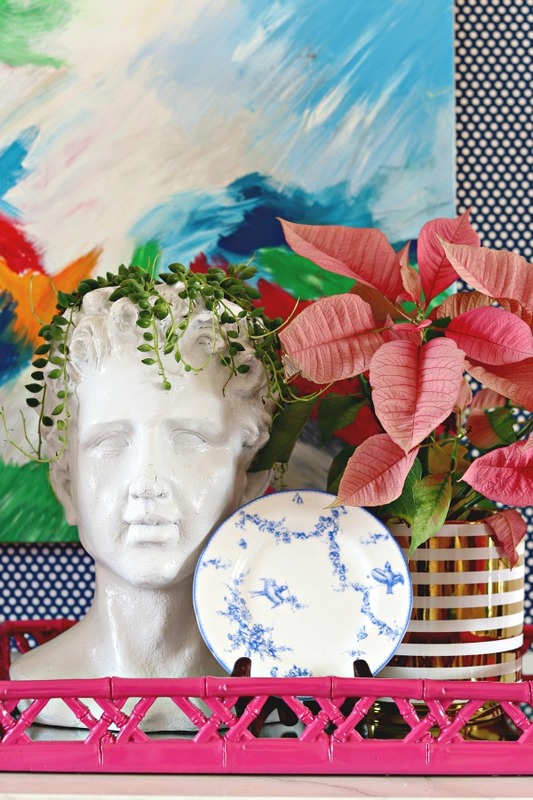 I love LOVE your home and your fearless approach to bold color. It's a cold, snowy day here in Maryland, touring your home was that ray of sunshine I needed. Beautiful! Aww, thank you Cristina! 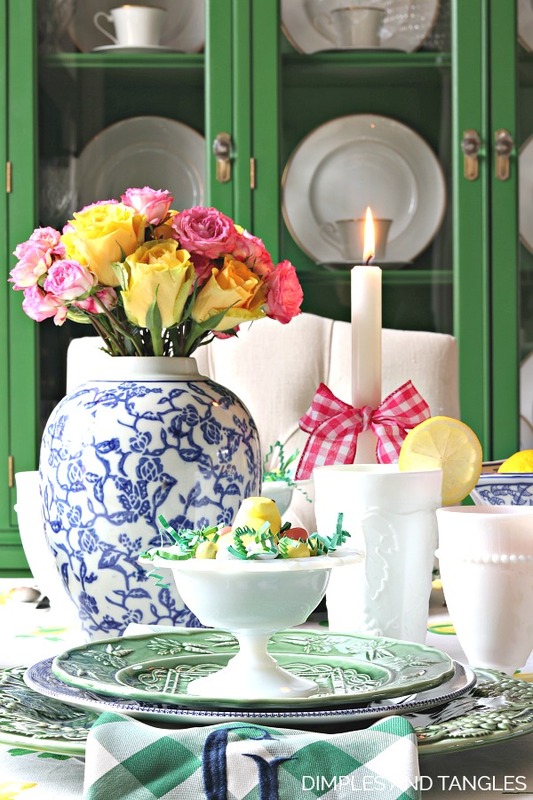 Love how color can lift the spirits. Stay warm! You are amazing with your talent for mixing color and patterns ... Beautiful! I'm loving your new blue and white curtains, too!!! 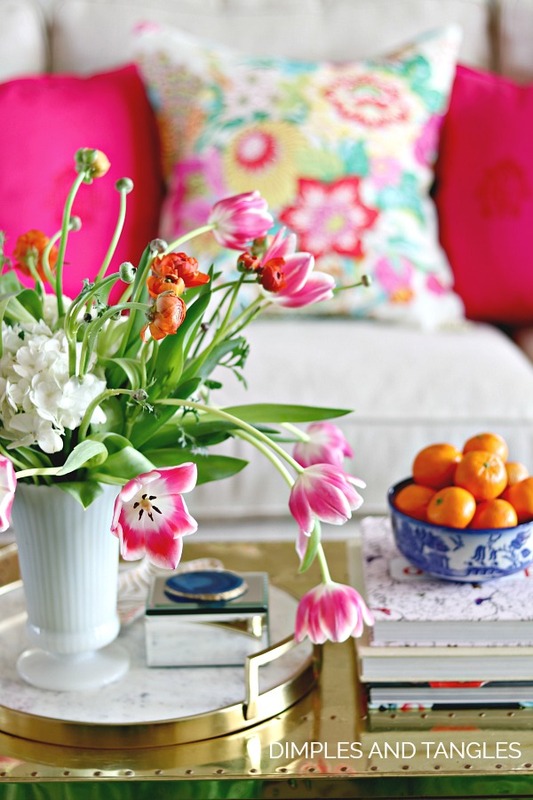 Always love your colorful home and attempt to do same here as you inspire me with the color! My sister says it's too much for her, and yet for me I love it! Admire that you can sew as I have no patience and the thought of making drapes no less, no way! Thanks Jen and HAPPY EASTER to you/family!! 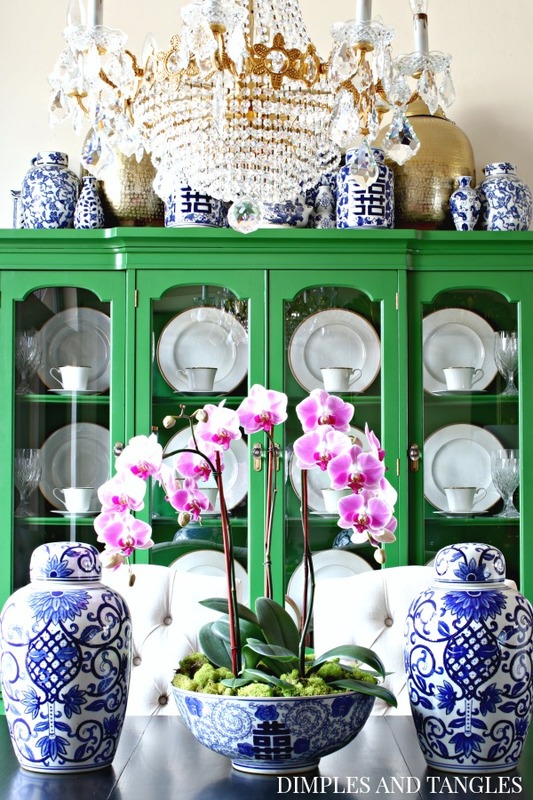 I love all the color in your home. 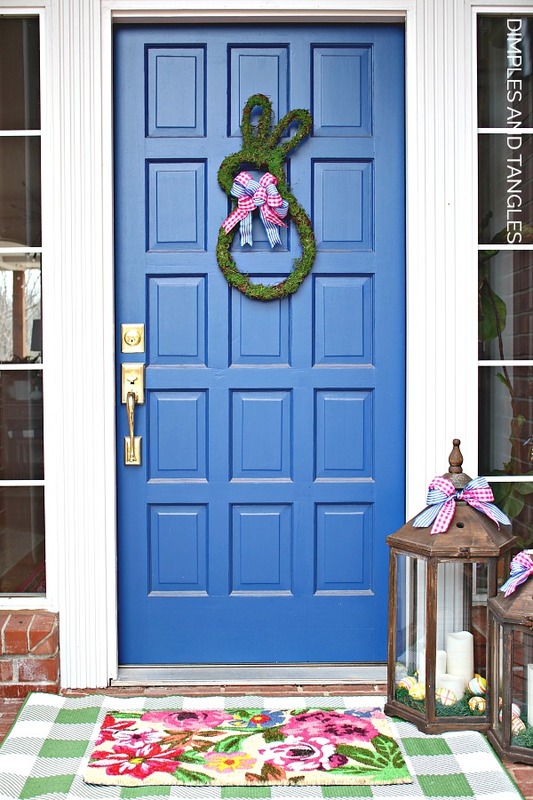 So pretty and that bunny door wreath is so precious. Happy Spring! My BFF just returned from England and brought me the same plate. I see you love it as much as I do! Absolutely gorgeous!!! You are so creative, talented and inspirational!!! Forgot to ask: where did you get the eggs in the lanterns? I have pinned this! Absolutely gorgeous! I adore your use of color. Shared multiple shots to my Facebook page! 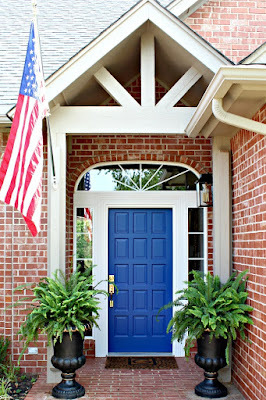 Jennifer, your front entry is just too cute! 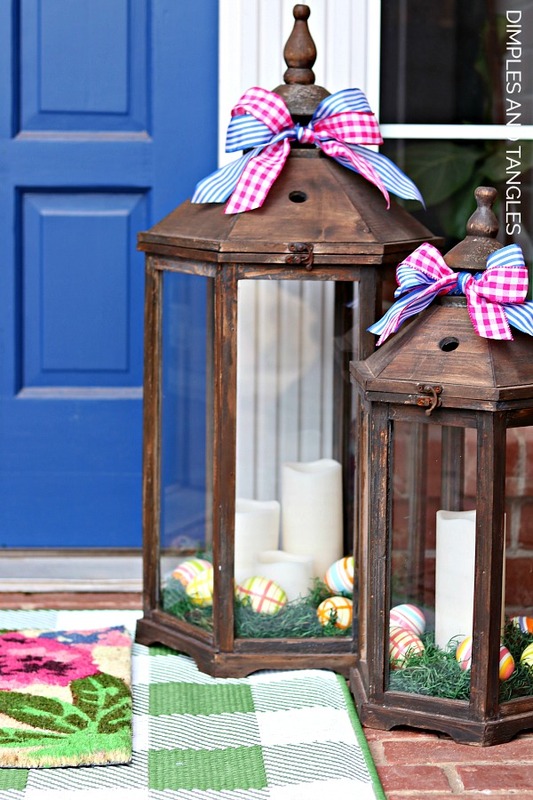 Love the little bunny on the door and the lanterns! The back of your bookshelves that you painted though - I'm in awe!!! Gorgeous! 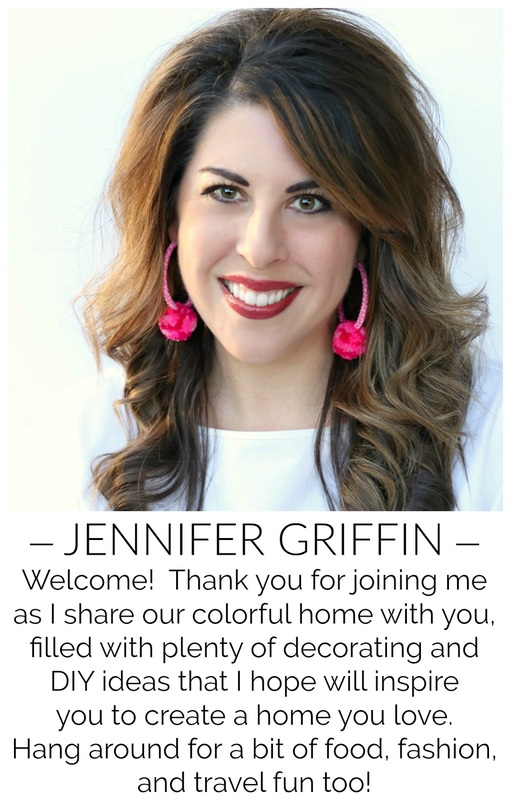 Jennifer--your spring colors make me happy! Your home is always one of my favorites and once again, you didn't disappoint. Happy Spring! 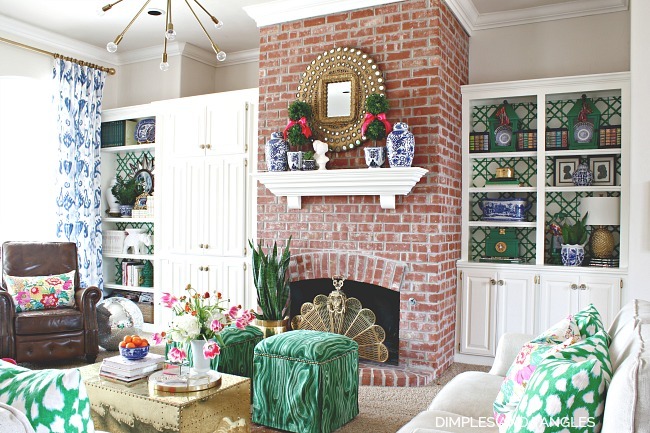 I can't believe those book shelves are painted?! I thought they were wallpaper! Looks absolutely gorgeous and so YOU my friend! 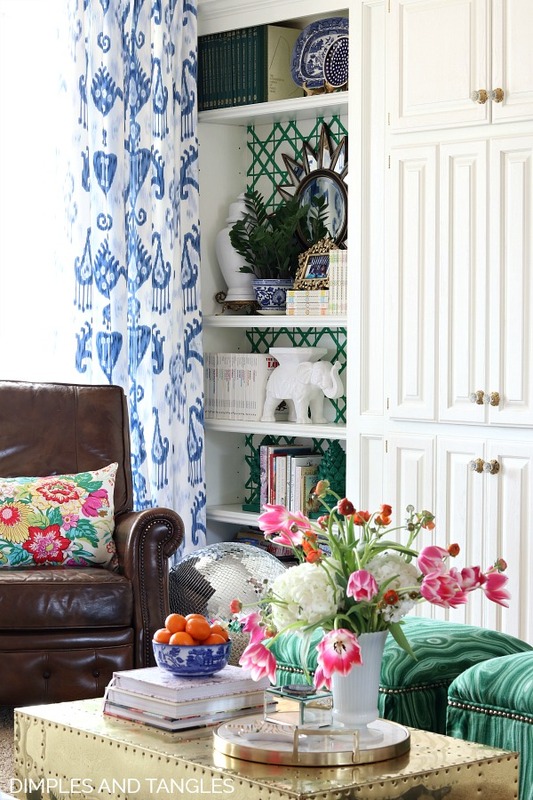 Love everything in your home tour as always, and the burst of color just makes me happy Jennifer! 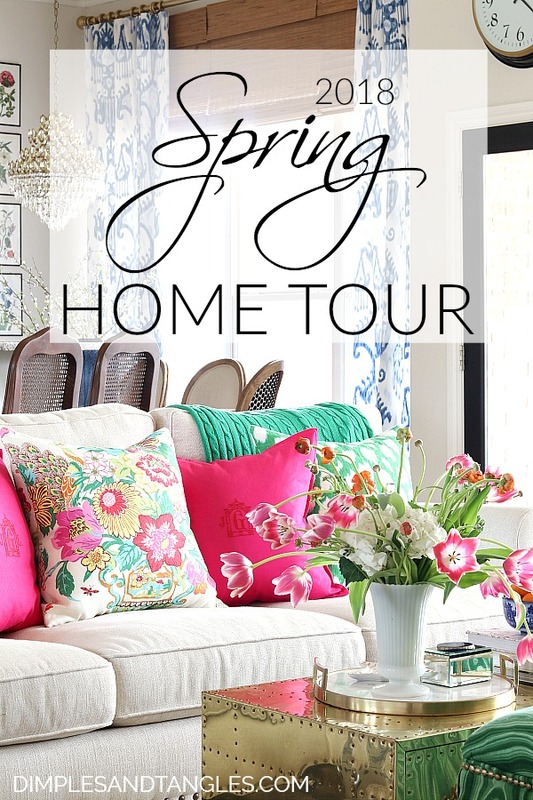 As always so honored to share this home tour with you dear! Cheers! Love, love, love this! Everything looks fantastic from the accessories to the new curtains, pillows and bookshelves! BHG needs to revisit! 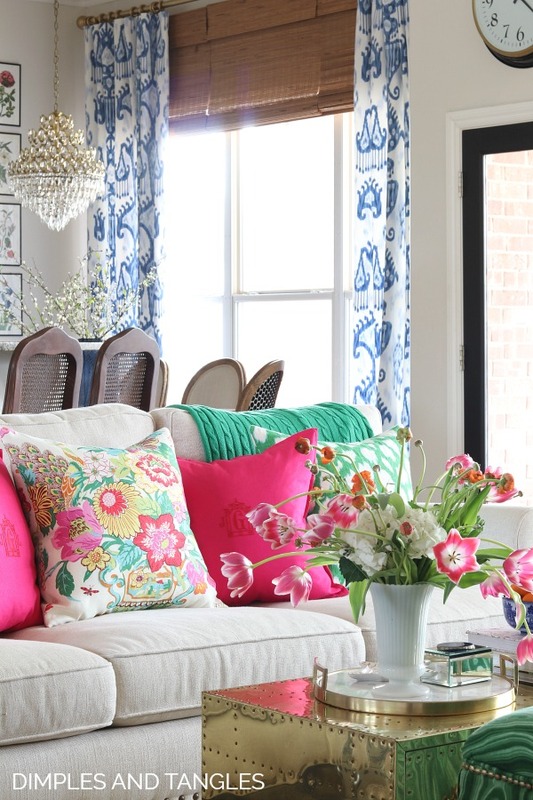 What size pillows do you have on your sofa? So pretty as always! 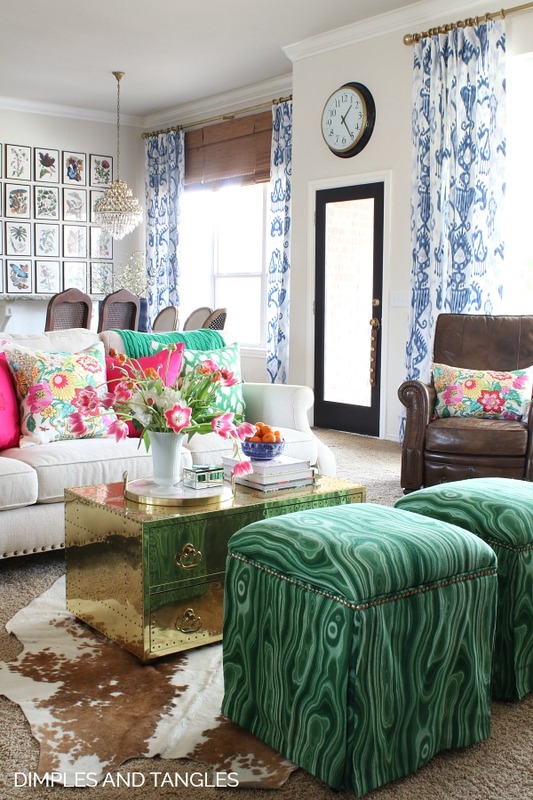 Love the mix of patterns and colors, it's a feast for the eyes! !